The increase in demand for support for mental wellbeing in universities is well documented. 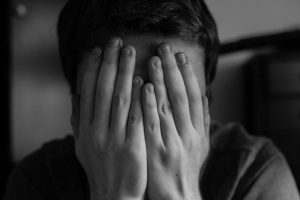 A recent YouGov report suggested that 1 in 4 university students suffer from mental health problems, whilst the Guardian has a series of articles suggesting that staff are still reluctant to disclose mental-health problems and that mental health problems affect up to half of staff in academia. Whilst the reasons behind these considerable numbers are complex and challenging, and universities, including ours, have support services in place, any preventative action we can take as a community, however small, can only help. Being involved in creative activities, either alone or together with others, can, for many, enhance mental well-being or indeed aid recovery from mental illness. 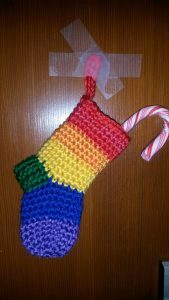 I am something of a crochet addict, and when I heard about Mind’s campaign to raise funds by holding “Crafternoons” I wondered about organising something but felt it would be too much for me to do. Having mentioned it in passing to some of our Executive Support team, I was surprised and overwhelmed when a couple of weeks later they announced that they had decided to organise one for me! And so it was that just before Christmas we filled the Vice Chancellor’s office with craft supplies provided using donations from the senior management group, and invited everyone to an hour of crafting and cake. Around 50 people dropped in during our “opening hours”. 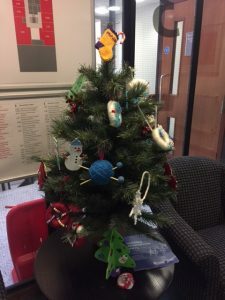 As well as crocheting and making decorations for our MIND Christmas tree, we had a tombola, sold home-crafted bird boxes and mini-stockings donated by staff and their families, talked and laughed a lot. I now know that one of our Pro Vice Chancellors makes fantastic banana cake, and that colouring is a surprisingly popular activity that appeals across all genders, ages and occupations. Perhaps a University of Reading colouring book is in order? Many of the attendees commented that it was great to do something really different during the working day, and that they were surprised by how they felt after doing something so obviously creative for even a short time. A huge thank you to everyone who got involved, mentioned us on Instagram, and especially those who organised it. Let us know if you would like to see more events like this! This entry was posted in Events, Mental Health and tagged craft, Events, Mental Health. Bookmark the permalink. This was a brilliant afternoon, and an innovative use of the VC’s office big meeting table! Great to raise profile of work of MIND, advocate and practice creative actiivities, and meet new colleagues in an informal setting (and who knew the VC’s office was that!) in the run up to Christmas. Thanks a lot Exec Support team, and count me in for next year! I never knew colouring could be so therapeutic. It was a great success and I really enjoyed being a part of it!! Thank you to everyone who helped make it the day it was.